Overview: Over the years, Wolverine has faced every foe possible, from Magneto to Apocalypse to Sabretooth. He’s even clashed with the mainstream villains like Dr. Doom. But leave it to his, the final Essential Wolverine collection, for Wolverine to go up against the ultimate force in the Marvel Universe – Galactus! Following the standard Wolverine vs. Sabretooth story that we are quite familiar with already, Wolverine gets caught up in an intergalactic tale. He gets kidnapped via a mutant who can control minds. Wolverine regains control to find himself mixed up with the Collector. With an assist from the Starjammers, Wolverine stops the Collector but finds he must now protect the various captives on the ship from Galactus. Wolverine learns that some battles cannot be won and that getting everyone out alive is the best victory you can hope for in this situation. Next up are a series of one-shot team-up issues, featuring the likes of Cable, Nightcrawler, Jubilee and Alpha Flight. It’s really surprising to me, given how insanely popular Wolverine became during this era, that Marvel never gave him his own team-up book, much like Spider-Man and the Thing had in the 1970s and 1980s. Finally, as part of the character’s 25th-anniversary celebration, Wolverine is finally reunited with his adamantium skeleton and claws. Professor Xavier has been forced to disband the X-Men when they find that Apocalypse has planted a fake Wolverine on their team. In all actuality, the real Wolverine finds himself as one of Apocalypse’s four horsemen, Death. Unfortunately, too much of the storyline is not reprinted here, so I’m going to need to check out the reprint collection of The Twelve to get a full idea of what is going on in this story. The final issue is part of the Ages of Apocalypse storyline, featuring a reunion of the All-New Fantastic Four (Wolverine, Spider-Man, Hulk and Ghost Rider), which was first introduced in Walt Simonson’s memorable run on Fantastic Four. It’s a fun mash-up of characters, and one that I wish Marvel would find a way to revisit again someday. What makes this Essential? : Why does this have to happen to me? Just when I really start to enjoy the Wolverine line of books, the Essential line comes to an end. I wasn’t reading the Wolverine title (or the X-Men books) in this era, so this was my first read of all of these issues. These are more interesting stories, especially those that do not get caught up in the current X-event. If you like this volume, try: the 2017 Logan movie. This may be Hugh Jackman’s best take on Wolverine in any of the X-Men and Wolverine movies over the last 20 years. Borrowing heavily from Old Man Logan, the film takes place sometime in the future, where most of the mutants have been killed off. Logan finds himself as Xavier’s caretaker, trying to help the Professor keep his abilities in check as dementia takes over his mind. A new mutant, Laura Kinney, appears on the scene, created from Logan’s DNA, making her Wolverine’s daughter. He agrees to take Laura to Eden, a safe place for mutants, only to discover that it’s a mythical place from a comic book. They are hunted by the Reavers, who are relentless in their pursuit of the mutants. Logan eventually finds Eden but must sacrifice himself to stop the Reavers and give the kids a chance to escape. This was a tremendous movie, doing well with both critics and the box-office returns. Overview: Welcome back, Wolverine! After an eight-year absence from the Essential schedule (see Footnotes), you finally have a new volume tracking your solo adventures away from the X-Men. This volume begins by finishing up a three-part story in the Savage Land fighting Sauron that was started in Essential Wolverine Vol. 3. From there, we get a story of Wolverine and Jubilee fighting Sentinels in the X-Men’s old headquarters in the Australian Outback. The highlight of this volume comes with Wolverine #75, which was a tie-in issue with the Fatal Attractions story-line in the X-Men books. In Fatal Attractions, Magneto returned once again to face off against Xavier’s students. In the course of the battle, Wolverine savagely cut up Magneto, leaving him severely wounded. In retaliation, Magneto used his powers to extract all of the adamantium out of Wolverine’s skeleton, as well as his claws. The story picks up in Wolverine #75, as the X-Men are returning to Earth as quickly as possible to get Wolverine medical treatment. His mutant healing factor is extended well beyond what it can handle, and his body seems to be shutting down. Thanks to the skills of his teammates, the X-Men get the plane safely to the ground, and Wolverine gets the help he needs to start his recovery. While he is recovering, Wolverine takes leave of the X-Men to travel the world and settle his affairs. That journey takes him to Canada, Madripoor, Japan, and back to Canada. During this period, Wolverine finds that he can extend “claws” made out of bone, but his body is having a hard time healing each time he bares the claws. The volume concludes with yet another showdown between Wolverine and Sabretooth. Wolverine finally returns to the X-Men’s mansion, and finds that Sabretooth is being held in a cell in the basement. As luck would have it, Sabretooth has been testing the limits of his holding cell, and finally manages to break free, leading to a battle with Logan. What makes this Essential? : I really enjoyed this volume, in particular when Wolverine was without the adamantium. This was a new take on the character, who now could be hurt, could be stopped, and potentially could be killed. This was a good move by Marvel to be able to do something completely different with the character. I think this is a must-own volume for the Wolverine and/or X-Men fan, if they do not already own the individual issues. 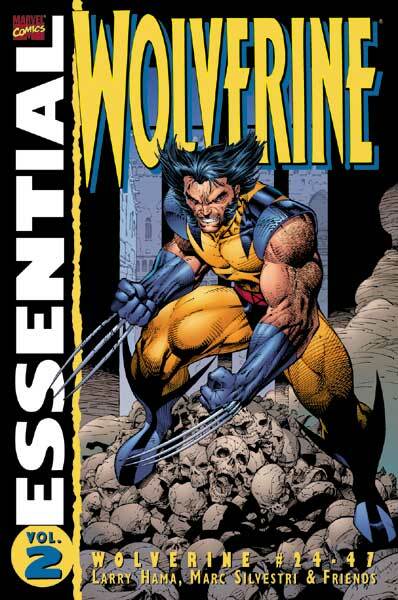 Missing in Action: Wolverine ’95 (the very first Wolverine annual) is not included in this Essential or Essential Wolverine Vol. 5. 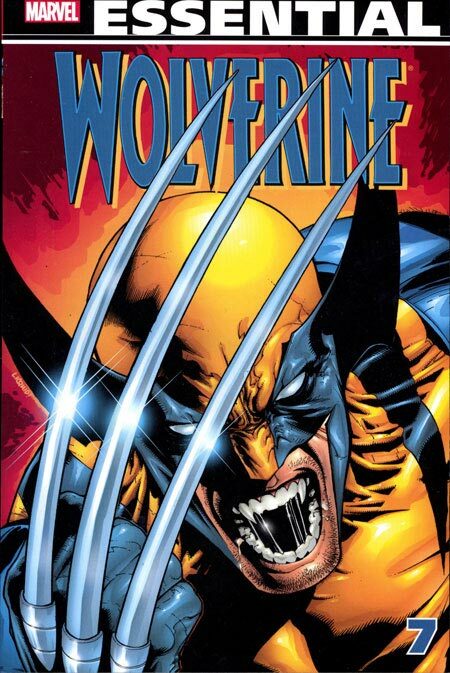 Volume 5 does contain the Wolverine ’96 annual. Footnotes: Essential Wolverine Vol. 3 was released in June of 1998, but Essential Wolverine Vol. 4 was not released until May of 2006. During the long gap, Marvel reprinted Volumes 1-3 multiple times, as the cover format was updated in the early 2000s. With the changes in production process for comic books in the 1990s, the Black & White reprints of the comics in this volume come across as very dark, and are at times hard to read. If you like this volume, try: Alpha Flight, in particular the first two years of the monthly book done by John Byrne. In the early days of the Chris Claremont-John Byrne run on X-Men, some stories started diving into the background of Wolverine. We found out that Wolverine had been part of a super-hero team in Canada, known as Alpha Flight. The first encounter (Uncanny X-Men #109, Essential X-Men Vol. 1) had Guardian trying to bring Logan back to Canada to fulfill his obligations. The next encounter (Uncanny X-Men #120 & #121, Essential X-Men Vol. 2) gave us the first full meeting of Alpha Flight. Over the next couple of years, Alpha Flight would make sporadic appearances before moving into their own monthly book in 1983, written and pencilled by Byrne. Over the next two years, Byrne broke up the team and then brought them back again, fleshing out the characters and providing more history to Wolverine’s past. The Byrne issues have been collected into three Alpha Flight Classics, so they should be easy to track down. Overview: Pop open a cold brewski, light a cigar, and sit back to enjoy the latest collection of Wolverine stories from the early 1990s. But drink and smoke in moderation, because I’m willing to bet you do not have a mutant healing factor to offset the vices. Kicking off this volume, Wolverine enlists the X-Men’s help as he struggles to put the pieces together of his mysterious past. Following the events of Weapon X, Wolverine encounters former members of Team X, as he realized that he was not the only person who was experimented on. Next up is a time-traveling adventure that brings Logan and Mystique together to stop Mojo. Parts of this story will remain a mystery until it is revisited by Larry Hama later on in his run, which will be collected in Essential Wolverine Vol. 4. Wolverine finds himself going to Japan to bail out Jubilee. This leads to an encounter with his beloved Mariko, whose life comes to a tragic end during a battle with the Hand. The loss of Mariko sends Wolverine spiraling downward in a depression trying to deal with her death. Strangely, this volume ends with issue #69, which started a three-issue story involving Rogue and Sauron in the Savage Land. If you were only reading Wolverine by Essential volumes, you were forced to wait eight years to read the conclusion of that story (see Footnotes). What makes this Essential? : This is an interesting collection, as the comics cover all the variations of the typical Wolverine tale – stories involving the X-Men; time-travel stories; Wolverine in Japan; fights with Sabertooth; and the occasional filler issue featuring the rising star character, such as Shatterstar. So this is a good example of a lot of the different stories that can be told with Logan. My concern with this volume, as with the previous Essential, is that most of these stories are not memorable. I struggle to write a review for this, as I am not recalling these stories. This is a case where the character justifies the volume, but not necessarily the stories contained within the Essential. Footnotes: Once again, the cover spells Silvestri’s first name with a K (Mark), but it should be spelled with a C (Marc). Because of the number of double-page spreads, the covers to some stories appear at the end of the story to minimize the number of blank pages in the book. Unfortunately, this meant some issues ended and the next started up without the reader noticing until the next set of issue credits comes up. For example, with the final four issues in this volume, it runs: Cover to #66, Issue #66; Issue #67; Cover to #67; Issue #68; Cover to #68; Cover to #69; and Issue #69. 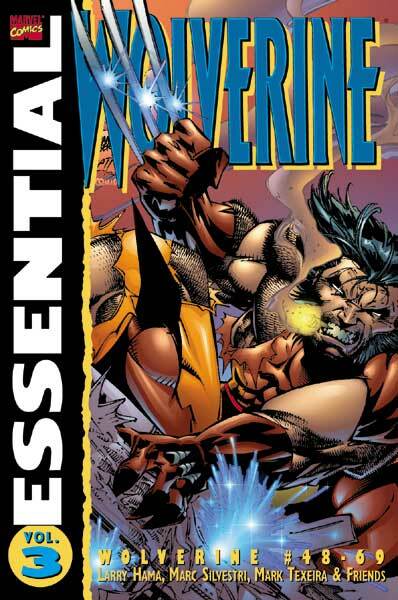 Essential Wolverine Vol. 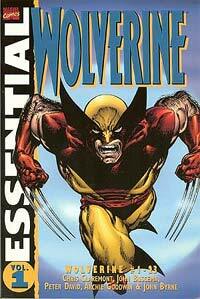 3 was released in June of 1998, but Essential Wolverine Vol. 4 was not released until May of 2006. During the long gap, Marvel reprinted Volumes 1-3 multiple times, as the cover format was updated in the early 2000s. If you like this volume, try: the Weapon X story, if you have not read it already. And shame on you if you haven’t read this! The story originally ran in Marvel Comics Presents as a 13-part story. It has been collected multiple times in multiple formats, so it should not be hard to find. Written and exquisitely drawn by Barry Windsor-Smith, we finally learn how Logan received the adamantium in his skeleton. As many questions as this story answered, it also introduced even more questions into the back story of Wolverine. 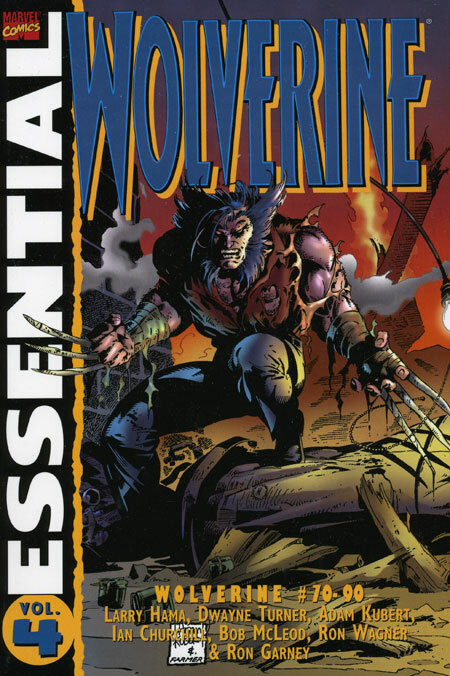 The initial story arc in this Essential serves as a sequel to the Weapon X story, as Wolverine meets up with other participants from the Weapon X complex. Overview: Welcome to the continuing solo adventures of Wolverine, who proves over and over again that he is the best at what he does, and what he does best is not very nice. Returning to Madripoor, his home away from the X-Men, Wolverine once again gets into a skirmish between the gang lords on the island. Once again, Logan gets a helping hand from Karma, a former member of the New Mutants who works for her uncle. In this volume, writer Larry Hama comes on board as the regular scribe for the book. Joining him at this time would be one of the hot artists of the era, Marc Silvestri, who would put in time here before jumping from Marvel to become one of the co-founders of Image Comics. During these stories, we see the return of Lady Deathstrike, who wants the adamantium from Wolverine’s bones. This leads into an interesting time-travel story with Puck from Alpha Flight that sends the two back to Spain in the late 1930s, caught up in the Spanish Civil War with Ernest Hemingway. Once that caper wraps up, Donald Pierce from the Hellfire Club plots another attempt to kill Wolverine. This time by creating an android duplicate of Wolverine, dubbed Albert, and partnering him with an android child, Elsie Dee, who is packed with enough explosives to kill even Wolverine. Both androids rebel against their programming, preferring to stay alive over completing their assigned missions. What makes this Essential? : This volume starts the Hama-Silvestri run on the book, which turns out to be a good partnership. The problem I have with this book is that none of the stories are memorable. I finished reading this a week ago, and I am having a hard time recalling stories other than the Puck & Ernest Hemingway four-parter, and the way too-long story arc with Albert & Elsie Dee. As a result, these may be OK stories, but I can’t call them Essential. Footnotes: The cover spells Silvestri’s first name with a K (Mark), but it should be spelled with a C (Marc). If you like this volume, try: the Havok & Wolverine mini-series from 1988. Written by Louise & Walt Simonson, with art by Jon Jay Muth and Kent Williams. This prestige-format series teamed up Wolverine with Scott Summers’ younger brother, who had recently rejoined the X-Men. The story starts off with Logan and Alex taking a vacation in Mexico. However, it seems trouble has a way of finding Wolverine wherever he goes. In this case, terrorists have targeted the pair, hoping to use Havok’s mutant ability to power up a Russian terrorist known as Meltdown. Long story short, chaos ensues. This series has been collected a few times in trade paperback and hardcover. However, the most recent edition was released in 2003, 2o you may have better luck tracking these four issues down in a back-issue bin.